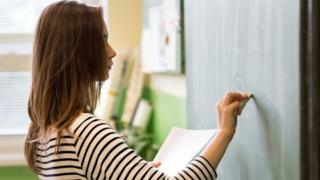 UK teachers were awarded millions of pounds in compensation from schools last year after suffering “appalling treatment”, a union has claimed. The NASUWT teachers’ union said its members had received £14.9m over the past 12 months as a result of attacks, injuries and discrimination at work. One teacher received £10,000 after being racially abused more than a dozen times in 18 months, the NASUWT said. The Department for Education said schools had a “duty” to protect staff. The union also reported that a 54-year-old disabled member of teaching staff received £45,000 after being dismissed for querying the failure to put in place reasonable adjustments to enable him to do his job. Other cases included members experiencing assaults from pupils, discriminatory practices related to pregnancy-related and flexible-working requests, race discrimination and discrimination based on age, sexual orientation and religion or belief. A DfE spokeswoman said: “No teacher should face discrimination or ill-treatment in the workplace. Despite winning financial compensation for many of its members, the NASUWT said it believed the recorded cases of abuse were “only the tip of the iceberg”.